Home Proludic news Happy 30th Birthday Proludic ! 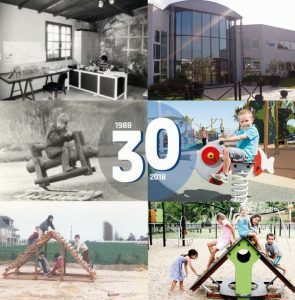 30 years of creating happiness and smiles through play! 30 years ago, Denis Le Poupon a landscaper then, manufactured a play structure for his wife’s school. At the time Denis was unaware of the significance of what he had produced, but effectively that marked the start of a lifetimes journey building the company that we know today as Proludic. Encouraged by the success of this design and enchanted by the world of children’s playground equipment, it was at this moment that he decided to manufacture further play equipment items using chestnut wood. Over the following years, the rustic look and style was modified as machinery was purchased to cut and drill logs. Coloured panels and square posts were also incorporated in to the design of the equipment and the Proludic range was further expanded. In 1988 Proludic’s first colour catalogue was produced. The Australian subsidiary came 22 years later. The rest is history as they say and now the company has achieved a distribution network spanning the globe through its six subsidiaries and fifty distributors. With over 80,000 play and sports areas completed globally to date, Proludic’s core values of innovation, experience, commitment and involvement are still at the heart of everything we do. What is even more remarkable is that Proludic is still a family owned business and run by Denis to this day ! Proludic wins Gold at the 2018 Good Design Awards!